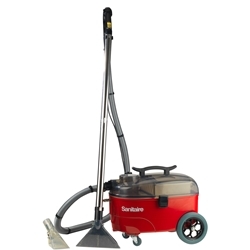 The 1.5 gallon Spot Clean Extractor features removable solution and recovery tanks with large easy-roll wheels. With the targeted spray/suction hose nozzle, the floor tool and the utility hand tools, you always have what you need to quickly clean-up spots on carpets, stairs, upholstery, drapes and vehicles. Cord Length = 15 ft. Hose Length = 8 Ft.